Status: Contest finished on 15-06-2010. Morgan Page, DJ Deals and Nettwerk Music are running a competition. Remix the track Fight For You to win some awesome prizes, including Ultrasone HFI-700 Headphones and a digital release. You have only one week to submit your entry! 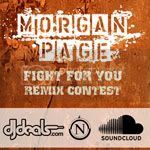 Morgan Page & DJ Deals in conjunction with Nettwerk Music Group have teamed up to present you with the official Fight For You Remix Contest. Empowering fans with the complete set of “Fight For You” stems, Morgan Page and Nettwerk is looking for the best fan-sourced “Fight For You” remix on the web. Find complete contest details below and get started now! To get started, we have made a “Fight For You” stem pack accessible here. Package includes 10 high quality audio tracks featuring guitar, keys, vocal, and bass layers of “Fight For You.” The complete 10 track pack can be downloaded as uncompressed Apple Lossless, FLAC, or 320 kbs MP3 files for $3.99. 1. Use a “Fight For You” MP3 or download the “Fight For You” stem pack here. 3. When finished, upload the track here and note your name and email address in the track description. Submissions: All entries must be submitted as an audio file through Soundcloud. Please note your name and email address in the track description and confirm your track via email. If you have any technical issues with delivering the track, please email us here. It is recommended that you set your remix as a free download, but not required. Submissions will be scaled on creativity, use of stems, and overall enjoyment of the track. Viral pick up of the track on social networks and blogs will also be considered so please share and spread your track for bonus points. The judging panel will include Nettwerk Records, Abbot Monroe Management, and ultimately decided by Morgan Page. *By submitting a remix, Nettwerk Music Group reserves full rights to the track. For full terms and regulations, please email us here. Are you going to enter the comp? Yes…sorry for that, I found the comp a little late! enough that you found it at all!